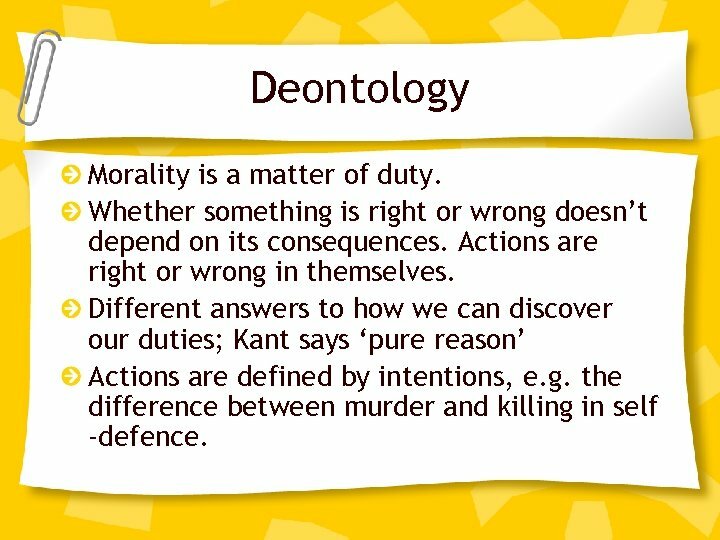 Deontology Morality is a matter of duty. Whether something is right or wrong doesn’t depend on its consequences. Actions are right or wrong in themselves. 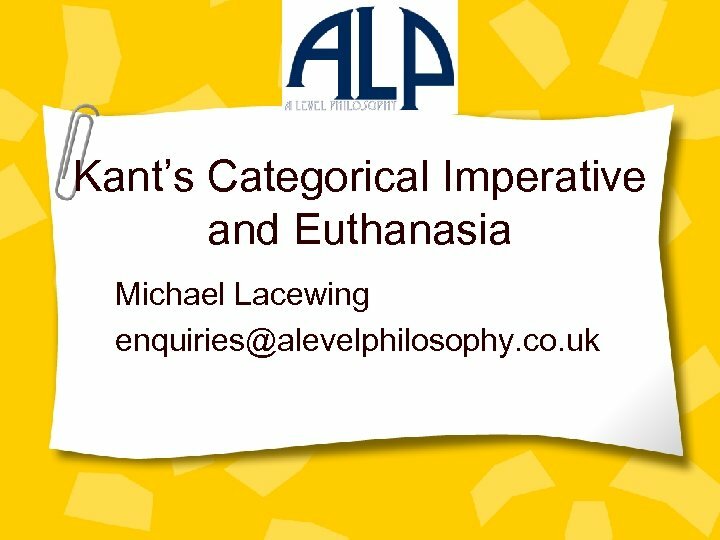 Different answers to how we can discover our duties; Kant says ‘pure reason’ Actions are defined by intentions, e. g. the difference between murder and killing in self -defence. 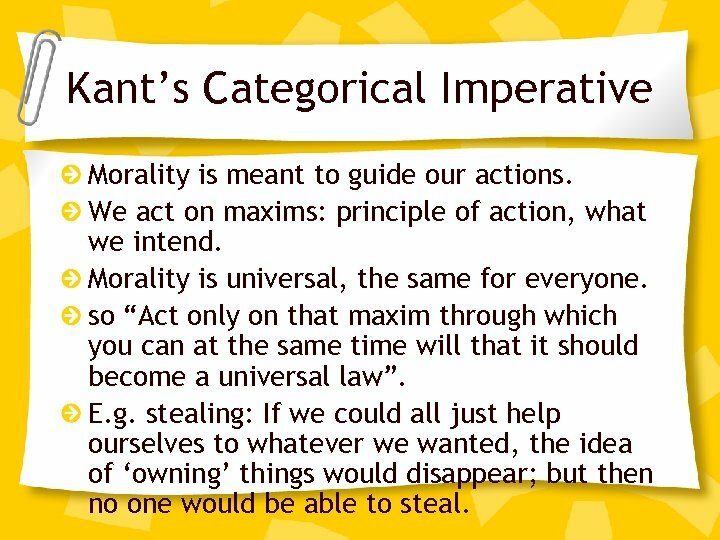 Kant’s Categorical Imperative Morality is meant to guide our actions. We act on maxims: principle of action, what we intend. Morality is universal, the same for everyone. so “Act only on that maxim through which you can at the same time will that it should become a universal law”. E. g. stealing: If we could all just help ourselves to whatever we wanted, the idea of ‘owning’ things would disappear; but then no one would be able to steal. Imperatives An imperative is just a command. A hypothetical imperative is a command that presupposes some further goal or end. 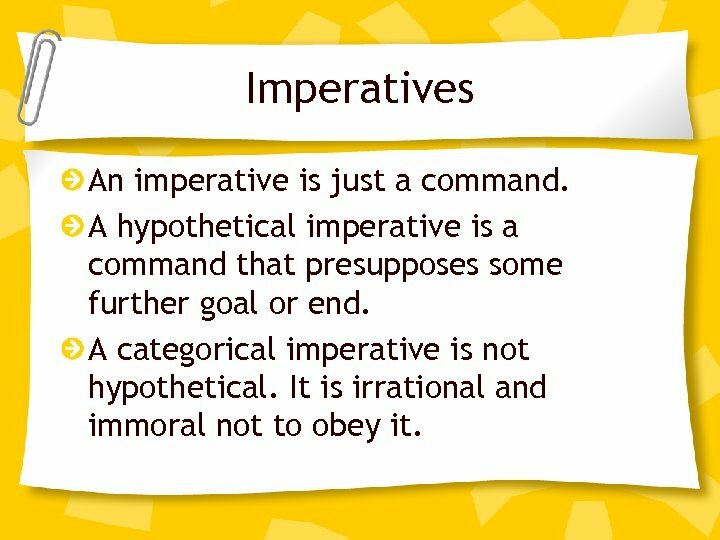 A categorical imperative is not hypothetical. It is irrational and immoral not to obey it. Happiness and reason Only reason and happiness motivate us. Morality motivates us, so must be one of these. It can’t be happiness, since what makes people happy differs, and happiness can be good or bad. 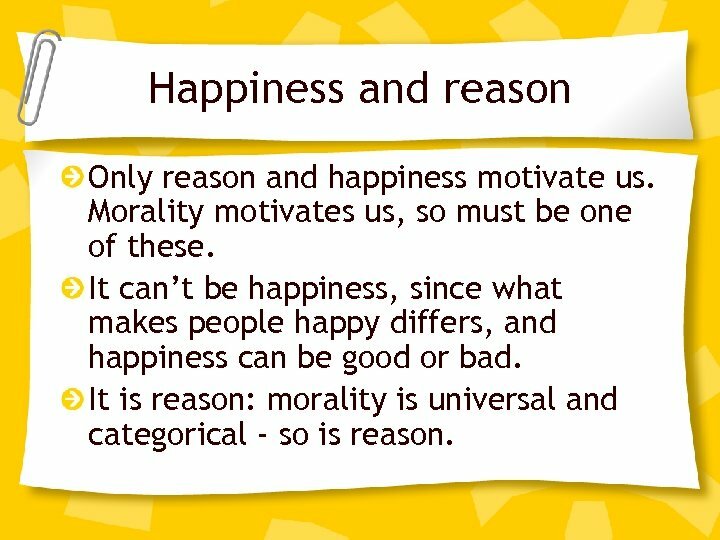 It is reason: morality is universal and categorical - so is reason. 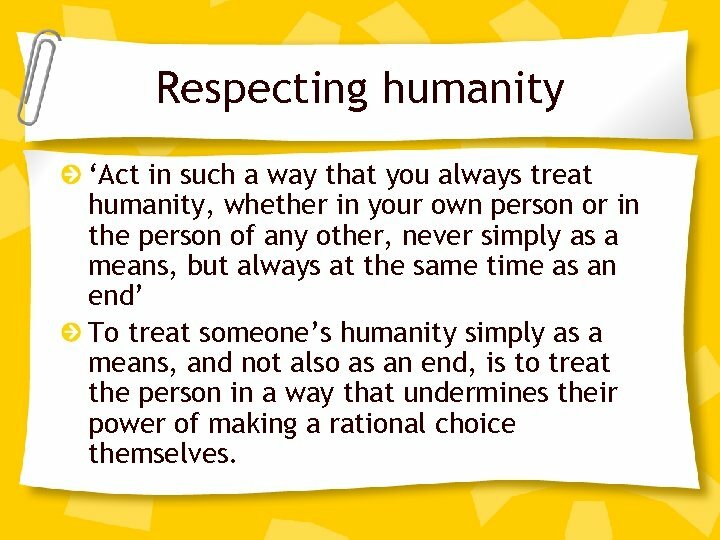 Respecting humanity ‘Act in such a way that you always treat humanity, whether in your own person or in the person of any other, never simply as a means, but always at the same time as an end’ To treat someone’s humanity simply as a means, and not also as an end, is to treat the person in a way that undermines their power of making a rational choice themselves. 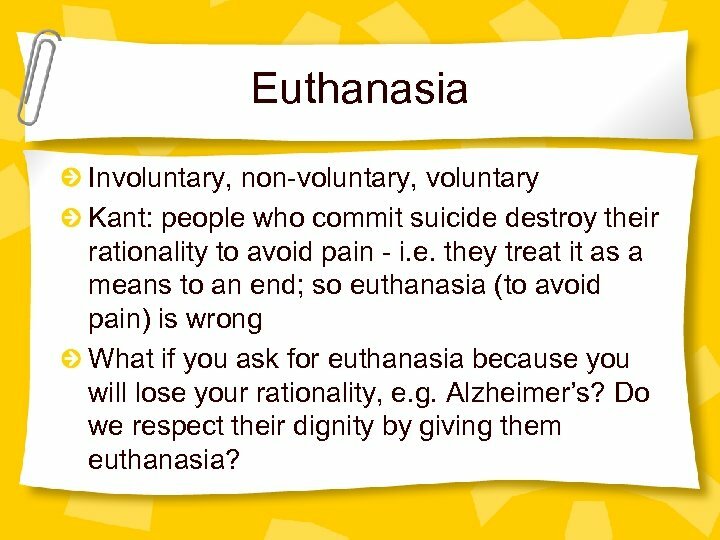 Euthanasia Involuntary, non-voluntary, voluntary Kant: people who commit suicide destroy their rationality to avoid pain - i. e. they treat it as a means to an end; so euthanasia (to avoid pain) is wrong What if you ask for euthanasia because you will lose your rationality, e. g. Alzheimer’s? 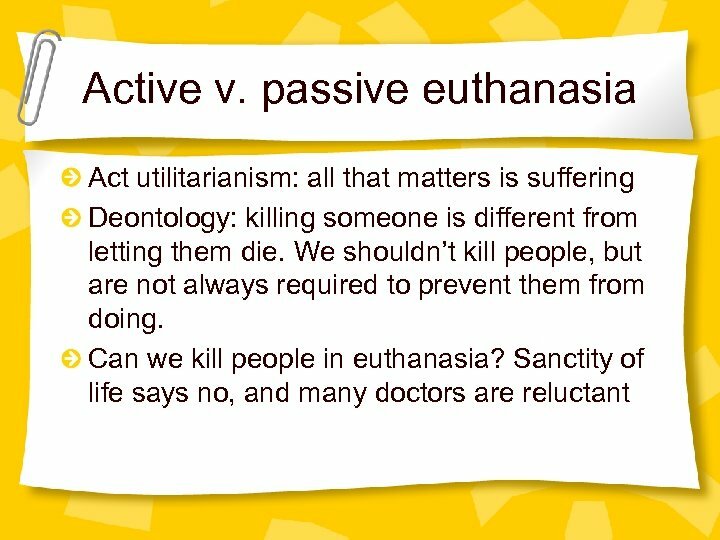 Do we respect their dignity by giving them euthanasia? Objections Any action can be justified, as long as we phrase the maxim cleverly. – But the test is what our maxim really is. Conflict of duties – Duties never really conflict, but knowing how to apply the CI requires judgment. 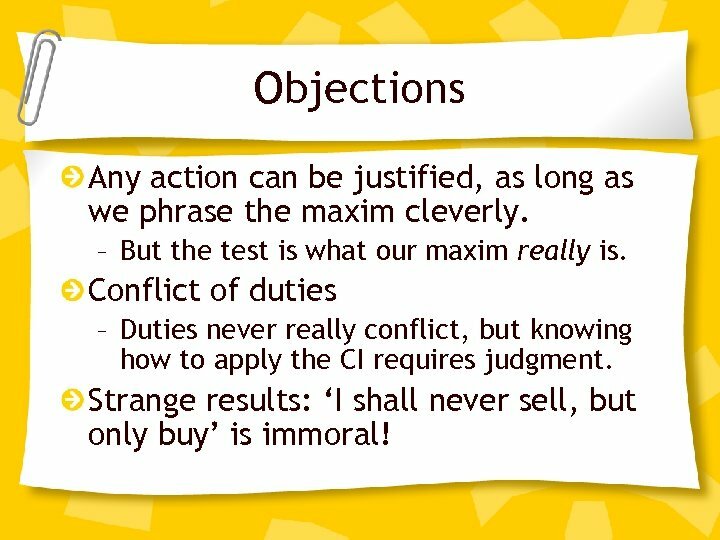 Strange results: ‘I shall never sell, but only buy’ is immoral!